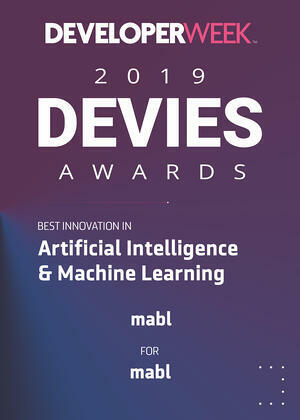 We are very excited to say that mabl has been honored with the 2019 DEVIES Award for Best Innovation in Artificial Intelligence & Machine Learning! The DEVIES recognize technical innovation, adoption and reception in the developer technology industry and by the developer community. They are the accompanying awards of DeveloperWeek, the world's largest developer trade show. "Developer technologies and tools are massively growing in their importance to a business' operations. mabl is a great example of the new era of products and services empowering developers and engineers to have a greater impact on a company's bottom line," said Geoff Domoracki, CEO of DevNetwork, the producer of DeveloperWeek. You can see how mabl is innovating with ML & AI by trying it out for yourself for free!